Please fill out the form below to get your Free Information Kit! An educational franchise comparison chart, including royalties, growth rate, and product results. How much you can make, with detailed information on revenues and expenses of operating a center. Top franchise performer profiles. Get actual profiles of top performers, and see how you measure up. Why are we providing this information? If you are in the market for an educational franchise, we want to make sure our franchise is a part of your research. By sharing our numbers and unique franchise opportunity, we hope you will get excited about opening your own LearningRx Brain Training Center. 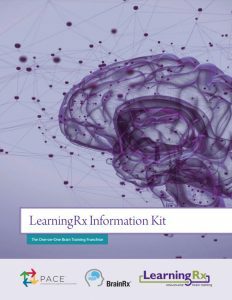 By giving us your email, you are agreeing to receive promotional emails from LearningRx, including our monthly BrainBuzz e-newsletter. You can opt-out of promotional emails at any time. Already Have the Info Kit? If you’ve already downloaded our Info Kit and you’re ready to take the next step, please complete our Intro Call Questionnaire. A member of our team will then contact you to schedule your first call!